Southampton, New York is the oldest settlement in the state, and the residents decided to make their home the first in another regard: Southampton is the first community in the state of New York to ban disposable plastic bans. After a year of public hearings the town rallied and the ban was approved. The notion of the bag ban picked up momentum amid concerns about the choking hazard plastic bags pose to wildlife and unsightly litter. The road to the ban was not without issues and disputes, but the residents and the town board were able to work together to make the plastic bag ban a reality. “I think it is all good, I think it’s all for the best. I’m really proud of the town,” said resident Julia Gruen. pharmacies, and carry out eateries. Extra-large plastic bags, like the kind used at most clothing stores are still legal under the ban. That is not to say that just because plastic bags are available shoppers are not free to bring their own reusable bags when shopping for clothing. Stores impacted by the ban that do not comply with the measure could face fines up to $1,000 or up to two weeks in jail. The town plans to give stores and shoppers alike time to get use to the ban, but they will send code enforcement officers out and about to make sure local business abide by the ban. In many stores shoppers will receive a nickel rebate for each reusable bag they bring with them, and paper bags will still be available for a charge of 5 cents per bag. Adrienne Esposito of the Citizen’s Campaign for the Environment summed up the towns stance when she said, “We’re thrilled. 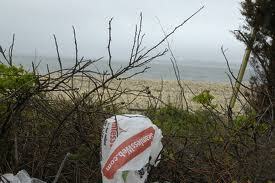 Plastic bags are a major pollution source for beaches, bays, park lands, highways, neighborhoods and communities.” A unique aspect of the ban was that multiple community based groups stepped up to help make the ban a reality. One such group, SAVE, or Southampton Advocates for the Village Environment was a big supporter of the movement. Roger Blaugh, a co-chair of SAVE, credits the documentary film “Bag It” with inspiring himself and others to bring the issue to the village board. The film follows one man’s journey to reduce the amount of plastic he consumes, starting with plastic bags and moving on the other non-biodegradable items. To help get the ban off to a positive start members of SAVE have handed out reusable shopping bags donated by local merchants. Giving away reusable bags is a fantastic marketing opportunity. It allows residents to abide by the ban and spread the message of an advertising campaign or logo. When a shopper carries a reusable bag customized with a logo or branding message other people who pass this shopper, either other shoppers in the parking lot, pedestrians, or fellow riders on public transportation will be exposed to the message on the bag. Customized reusable bags can also help build loyalty with the owners. Giving out reusable bags emblazoned with a logo establishes the company as not just aware of environmental issues, but willing to do something about these issues. People with similar values will be able to identify with this company and the simple act of handing out a custom marketing item can help establish a long standing rapport. Southampton is about a 2 hour drive from New York City and is known as being a summer hotspot for those looking to get out of the City during the warmer months. Both year round resident and seasonal visitors take the time to enjoy nature and the outdoors while in the Hamptons. From beautiful beaches and picturesque streets lined with shops and cafes with outside seating, part of the Hamptons experience is to be outdoors as much as possible. The unsightly litter caused by plastic bags puts a definite damper on the experience. This motivated residents to ban plastic bags and keep the outdoor spaces and natural beauty free from ugly litter. Go to http://newyork.cbslocal.com/2011/11/04/southamptons-plastic-bag-ban-goes-into-effect-on-sunday/ or http://southampton.patch.com/articles/village-plastic-bag-ban-starts-sunday to read more about Southampton’s ban on single use plastic bags.